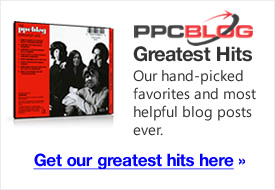 Does Google Instant Affect Your PPC Campaigns? Google rolled out Google Instant on September 8th, 2010. Google Instant is a major change in the way Google presents search results. Google now attempts to predict what term searchers are searching for, then shows updated search results, in real time, as the searcher types their query. Google reasons that Google Instant reduces the time it takes to search, and will particularly appeal to the mobile search market, as there is less need to scroll. However, eyebrows were raised, particularly amongst the PPC community. If Google matches on partial type-in keywords, does this mean fewer long-tail targeted keyword would be seen? Will targeting broad terms, and short terms, become more viable as the searcher is more likely to see them? Marketers were also concerned about potential tracking problems, such as a change in the way impressions will be counted. However, a new study reveals some very interesting data. Marin Software, a paid search management platform provider, released the results of a study that analyzed the effects of Instant Search on paid campaigns. The study was undertaken over two separate fortnightly periods, and across millions of keyword terms. The report looks at three main issues. How searchers behavior might change, particularly in relation to a visitors interaction with Adwords. Does Google Instant affect match type. For example, if searchers are presented with results immediately, does this make broad matching a more viable strategy? Google Instant has had a noticeable effect on PPC campaign performance. 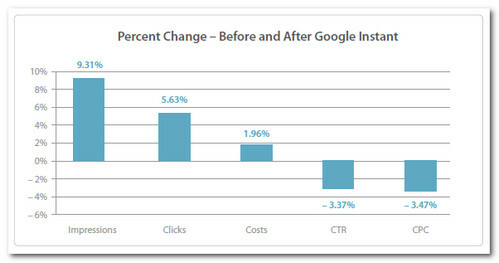 Impressions and clicks increased significantly – by 9.3% – whilst cost per click decreased. Overall campaign costs increased slightly. Google users preferred exact and phrase match terms, as opposed to broad match. It was curious that Google Instant did not skew user behavior towards broad-match clicks, as first feared. The reverse happened. Exact and phrase-match clicks gained in popularity. Google Instant may also be making it easier for the searcher to phrase a search query, especially if they didn’t quite know which terms to search on in order to get the results they were seeking. As the searcher rephrases the query, they may be pausing to click on ads. This raises the question of impression reporting. Counting impressions with Google Instant happens in three different ways. Click – If the user starts typing, then clicks anywhere on the page, an impression is counted. Keyword selection – An impression is counted when the search button is clicked, or a user selects a query. On the flip-side, searchers do have something in mind already. Just because Instant suggests a keyword doesn’t necessarily mean the searcher will opt for what Google suggests. In this sense, it is not surprising the broad match doesn’t trump exact match and long tail queries. Do You Need To Change Your PPC Strategy? Whilst analysis is ongoing, these early studies put a lot of fears to rest. You can still target long-tail searches in your PPC campaigns, and get good results. In fact, Google Instant appears to have made them even more lucrative. If you’re not targeting broad match and short queries now, there is little reason to change, at least as far as Google Instant is concerned. If, for some reason, you’re not phrase matching and exact matching, then you should do so.